A recent business trip to Switzerland resulted in the opportunity to use the countries railway system to get to the airport. I’d never been to Switzerland before but knew that the Swiss railway network, ran like the clockwork mechanisms the Swiss are famous for. And indeed, it did, everything ran bang on time, the trains were clean and frequent, as were the stations. 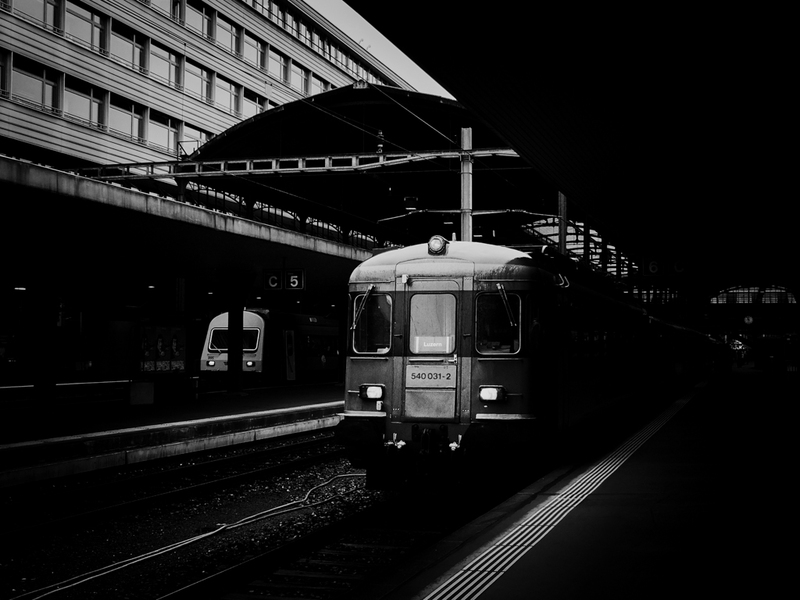 I didn’t get the chance to see much more than the local station near my hotel, and my time in the main station in Lucerne was limited to about 15 minutes hauling a suitcase and laptop bag round – not ideal for photography. However, I managed to capture this view of my train to Lucerne. The plate said it was built in 1963 but it was immaculate, and being electric, it was a smooth ride, except for the unusually well sprung seats, which were almost trampline like in their bounciness. I’ve converted to black and white and burnt in the background to get rid of some of the distracting background clutter, so as to emphasise the train in the light that was shining through the gap in the surrounding buildings. Previous Post #314 – It’s not about the space. Or is it? It’s a very nice picture that goes right into your theme of mechanical landscapes. I like the conversion to black and white, it makes it feel much more “mechanical” indeed. Yes, the Swizz trains are quite a treat, aren’t they? Thank you Otto, I couldn’t get the effect I wanted in colour. Perhaps I’m not good enough, or perhaps colour is more difficult to manipulate for the effect I want. And yes, the Swiss really know how to make trains work!